TiO2/WOx nanotubes have unique photo-energy retention properties that have gathered scientific interest. Herein, we report the synthesis, morphological characterization, and the electrochemical characterization of TiO2/WOx nanotubes compared with pure TiO2 nanotubes, prepared by anodization technique. Significant structural differences were not observed in TiO2/WOx nanotubes as observed by using scanning electron microscopy and transmission electron microscopy. The charge transfer resistance of TiO2/WOx before and after photo irradiation determined by using electrochemical impedance spectroscopy proves the inherent energy retention property which was not observed in pure TiO2 nanotubes. Solar energy is clean, safe, and limitless; hence, tapping solar energy would be beneficial at global scale. In order to realize a solar-driven energy conversion device, semiconducting materials are required that absorb sunlight and accomplish an unhindered electron injection from valence band to conduction band, enabling performance of electric work in the circuit. Photoelectrochemical (PEC) water splitting to generate hydrogen for its use as fuel is considered to be a feasible alternative and sustainable energy system. Ideal materials for photoelectrochemical water splitting are semiconductors, which Fujishima and Honda first demonstrated using TiO2. As a result, this field of research has gathered significant attention by the research fraternity to achieve a highly efficient system producing hydrogen and oxygen by splitting up of water using most of the solar spectrum supplemented by a little or no electrical energy. Metal oxides, in particular, TiO2 and WO3, possess congenial electronic structure leading to good photoactivity and chemical stability. Further, their low cost and availability in abundance make them the chosen material for photoanodic reactions in aqueous electrolytes . TiO2 has been a material extensively studied for water photooxidation . More recently, TiO2 nanotubes (TNT) have gained much attention due to its simple synthesis  and enhanced photoelectrochemical performance over its nanoparticle counterpart. Despite the improved performance of TiO2 nanotubes, enhancing the visible light activity as well as reducing the charge recombination losses is required to increase water-splitting efficiency if practical applications are to be realized. On the other hand, tungsten trioxide (WO3) is a visible light photoactive material  with a bandgap of approximately 2.7 eV. Although it is a promising material by itself, coupling it with TiO2 has shown to be beneficial in many applications . The formation of heterojunctions of two semiconductors is an appealing method to increase visible light activity while maintaining the properties of each component. Moreover, the incorporation of WO3 is, in particular, ambient due to the nearly similar ionic radius of W+6 to that of Ti4+. As a result of which WO3 can be easily coupled into the TiO2 lattice during anodization process. Titania nanotubes incorporated with tungsten oxide have been reported to possess enhanced optical and electronic properties compared to its pure form [6–14]. Further, this mixed oxide composite nanotube shows a unique photon energy retention feature, i.e., the photon to electrical energy conversion process does not cease immediately after curbing the photon influx but stops gradually. This feature in TiO2 + WOx nanotubes has not been studied in depth. Investigations angled from the energy retention viewpoint of this metal oxide composite and its effect over dye-sensitized solar cell and photoelectrochemical water splitting was conceptualized in this endeavor. Hence, in this present work, we have attempted to employ electrochemical impedance spectroscopy in evaluating TiO2/WOx nanotubes as a candidate material for water splitting. The TiO2/WO3 nanotubular composite was prepared through a single-step anodization of titanium in an aqueous bath of NH4F and H3PW12O40 (phosphotungstic acid (PTA)). The morphology of the nanotubes was characterized using scanning electron microscopy (SEM), transmission electron microscopy (TEM), and energy dispersive X-ray (EDX) analysis. The nanotubes were tested for its charge transfer resistance in an electrolyte at pH approximately 6 under air mass (AM) 1.5 simulated solar irradiation. A time-oriented electrochemical impedance spectroscopy was carried out to assess the charge retention property of the mixed oxide nanotube and was compared with its pure counterpart. Synthesis of TiO2 nanotubes and TiO2/WOx was carried out similar to previously reported procedure. In short, cleaned, polished titanium metal strips were anodized at DC voltage of 50 V for two and a half hour in an aqueous solution containing 0.5 wt.% NH4F for TNT synthesis and 0.5 wt.% NH4F with 2.4 wt.% PTA (Kanto Chemicals, Tokyo, Japan) for TNT-WOx synthesis. Preliminary studies indicated an amount of 2.4 wt.% of PTA to be the optimal loading . Firstly, the synthesized TiO2 and TiO2/WOx nanotubes were characterized by using scanning electron microscope (SEM; Hitachi Model H-4600, Tokyo, Japan) and transmission electron microscope (TEM; Hitachi Model H-7100, Tokyo, Japan) for its morphology. Secondly, the elemental analysis was carried out using energy dispersive X-ray (EDX; Horiba, Kyoto, Japan) analysis. Finally, the electrochemical experiments were carried out in a conventional three-electrode setup in which the TiO2 or TiO2/WOx served as the photoanode, Pt as the cathode, and Ag/AgCl as the reference electrode. The electrolyte used was 0.1 M NaOH (Kanto chemicals, Tokyo, Japan). A computer-controlled potentiostat coupled with a frequency response analyzer was used to control the potential and record the electrochemical impedance spectra (VersaStat-3, Princeton Applied Research, Oak Ridge, TN, USA). The photoanodes were illuminated by a 300 W solar simulator with an AM 1.5 at one sun intensity (Peccell Technologies, Inc., Yokohama, Japan) (approximately 87 mW/cm2). Scanning electron micrographs of TiO2 and TiO2/WOx nanotubes showed that the morphology of both types were similar (Figure 1a,b). The honeycomb-like arrangement of the nanotubes remained unaffected by the presence of PTA during the anodization of Ti for the formation of TiO2/WOx. The pores were well formed and appeared uniformly circular. In both, the pure TiO2 nanotubes and one with WOx, the pore size was found to be in a range of 90 to 120 nm. Further, the same was confirmed from transmission electron micrographs (Figure 2). Also, in the case of the TEM micrographs, the samples anodized in the presence of PTA showed intermittent dark spots which can be attributed to the presence of a heavier element compared to Ti indicating the incorporation of WOx. Energy dispersive X-ray analysis was carried out to determine the elemental composition of the nanotubes and to confirm the incorporation of the W in the nanotubes. Peaks at around 2.5 eV and at 9 eV confirmed the presence of W. WOx being the most stable form of W in an oxidizing medium, such as the one used in this study, and the presence of W can be ascribed to WOx. SEM image of TiO 2 and TiO 2 /WO x nanotubes. (a) SEM image of TiO2 nanotubes (b) SEM image of TiO2/WOx nanotubes. TEM image of TiO 2 /WO x nanotubes. A Nyquist plot at open-circuit potential condition of TiO2/WOx and TiO2 in 0.1 M NaOH under AM 1.5 solar-simulated irradiation is given in Figure 3a,b. The nonlinear regression fitting using a conventional Randle's circuit (R(QR)); routine gave Rct values of 1.48 × 104 and 6.22 × 104 Ω for TiO2/WOx nanotubes and TiO2 nanotubes, respectively. A lower charge transfer resistance is indicative of recombination suppression by improved charge transport to the electrolyte. The improvement of the TiO2/WOx system over TiO2 could be due to the formation of localized TiO2/WOx heterojunctions or through the formation of W6+ surface states which act as mediators for charge transfer to the electrolyte. 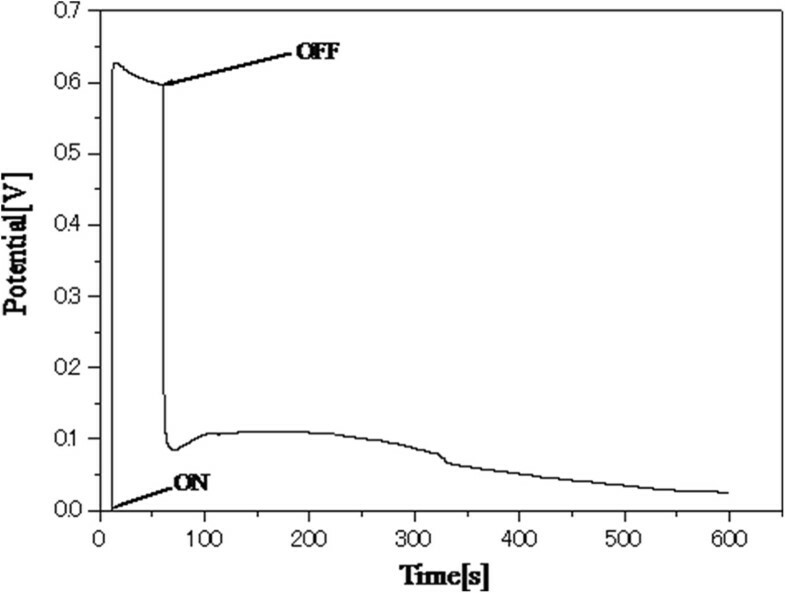 Electrochemical impedance spectra of (a) TiO 2 nanotubes (b) TiO 2 /WO x nanotubes in 0.1 M NaOH solution. In order to determine the photovoltage of the semiconductor material, the open-circuit potential (Voc) of TiO2/WOx electrodes were determined under photoirradiated condition as well as dark by constructing a conventional dye-sensitized solar cell in a sandwich-type configuration. The dye employed for this study was a commercially available N719 dye. 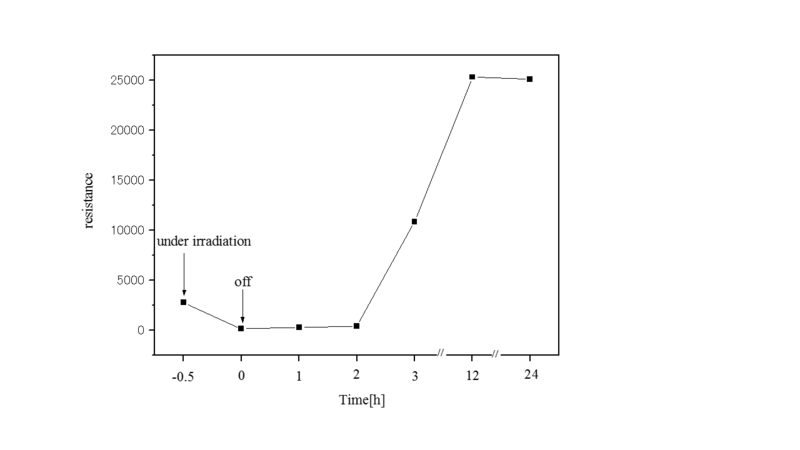 As depicted in Figure 4, the photovoltage increased steeply with photoirradiation to a value of 0.73 V and later steadied at 0.71 V. However, on cutting photon influx by switching off the light source, the photovoltage initially dropped drastically to a value of 0.093 V. This was followed by an anomalous trend in the photovoltage, wherein the voltage showed an increasing trend for a few seconds and reached a plateau at 0.12 V and stayed at this potential for approximately 100 s before starting to fall continuously to 0 V. This behavior in TiO2/WOx dye-sensitized electrode provoked further analysis to validate this behavior for other photocatalytic activity. Hence, a time-oriented electrochemical impedance spectroscopy was carried for both, the pure TiO2 nanotube electrode as well as the TiO2/WOx nanotube electrode. The impedance measurements were carried out before the photoirradiation and at regular intervals for 12 h after photoirradiating the electrodes for 15 min under one sun condition. The results of the impedance measurements are presented in Figure 5a,b. All spectra were fitted with appropriate equivalent circuits. Although complicated systems like the present one are fitted with transmission-type circuits, in order to understand the overall impedance behavior of the material, the simpler Randle's circuit (R(QR)) or the modified Randle's circuit (R(Q(RW))) with diffusion parameter was used. However, the charge transfer resistance of the material will remain unaffected. 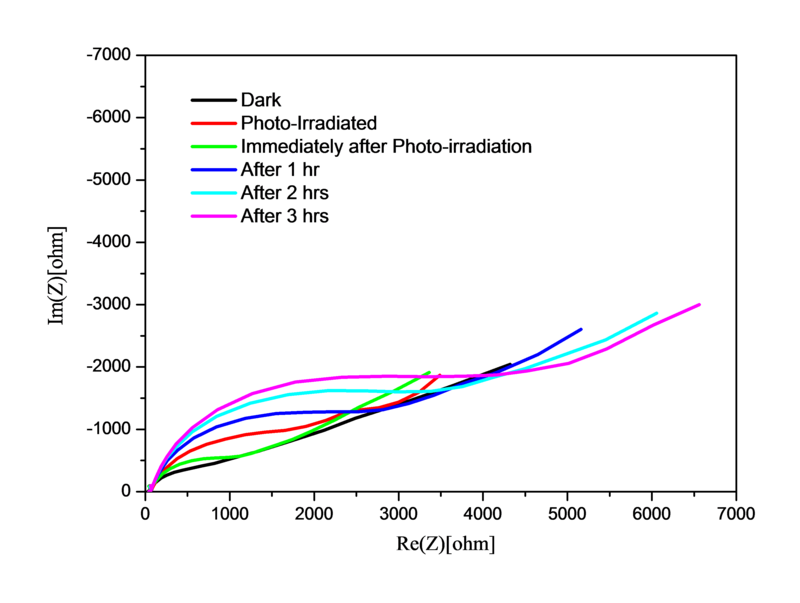 All the charge transfer resistances are plotted against time as shown in Figure 6. Both the TiO2 nanotubes as well as the TiO2/WOx electrodes exhibited decreased charge transfer resistance immediately after irradiation compared to the charge transfer resistance during irradiation. 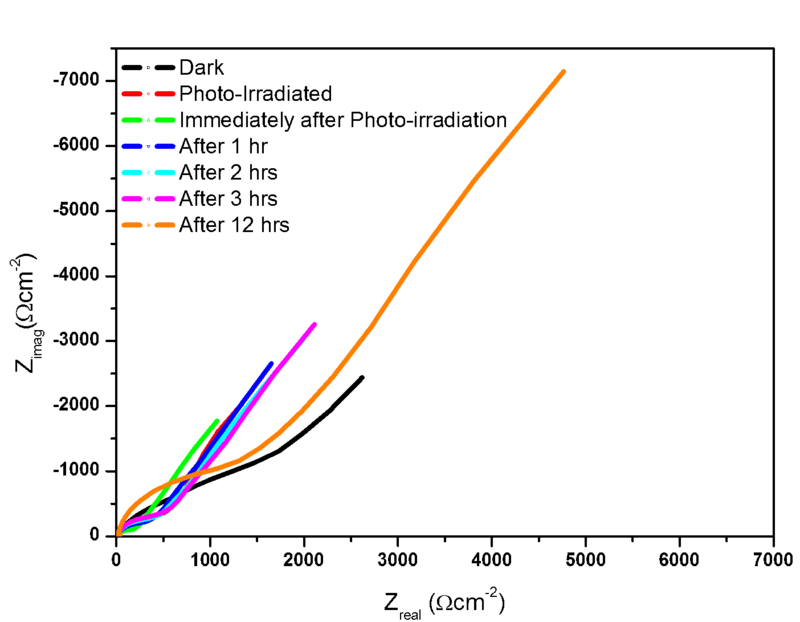 This can be attributed to the time lag involved in the excitation of the electron in to the conduction band, subsequent charge transfer from the electrolyte and the impedance measurement equilibrating time period. However, considering the constant error involved for both the systems, more significant observations were that the charge transfer resistance increased sharply under dark condition and attained a maximum within 3 h of curbing the photon influx in the case of the TiO2 nanotubes. On the other hand, in the case of TiO2/WOx nanotubes, the increase in charge transfer resistance after cutoff of photoirradiation was not evident and the resistance remained unchanged at a very low value for a period of 3 h before showing an increasing trend. 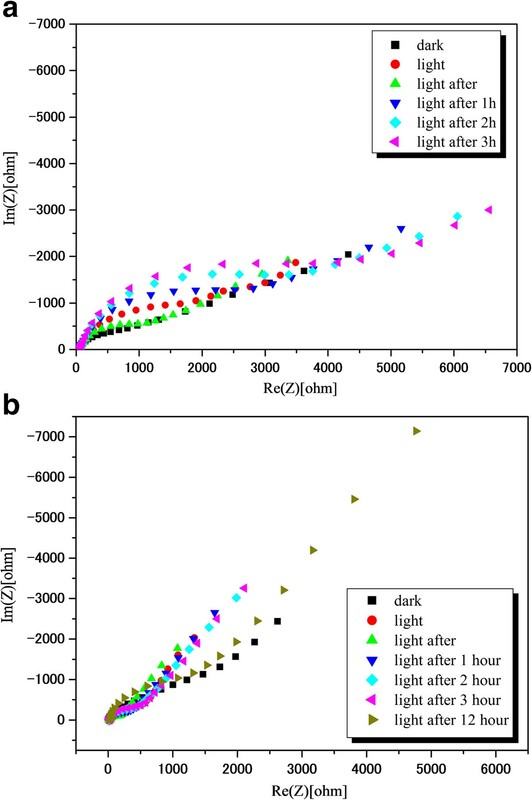 Further, the maximum resistance value was not attained before 12 h after curbing the photoirradiation. This phenomenon in the mixed oxide nanotube electrode can be attributed to the retention of energy by WOx during high photon influx and releasing it during photon starvation condition. This attribute of TiO2/WOx nanotubes could find potential application in photoelectrochemical water splitting. V oc of TNT/WO x in a dye-sensitized solar cell (N719 dye) under 1.5 AM simulated solar irradiation. 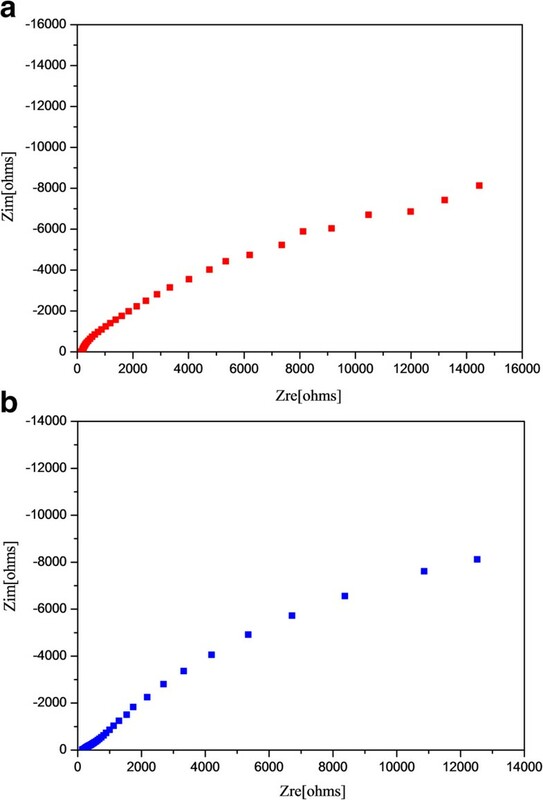 Nyquist plots of (a) TiO 2 nanotubes and (b) TiO 2 /WO x nanotube electrodes. In 0.1 M NaOH under 1.5 AM simulated solar irradiation. 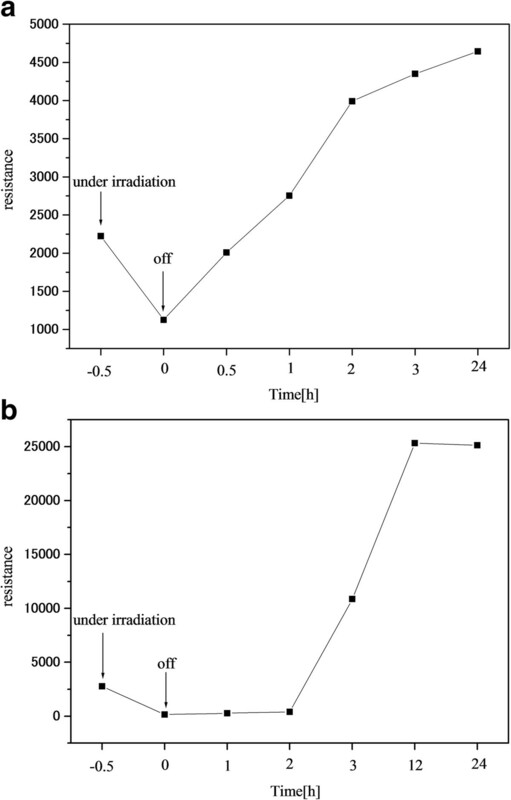 Effect of time on impedance after photoirradiation. 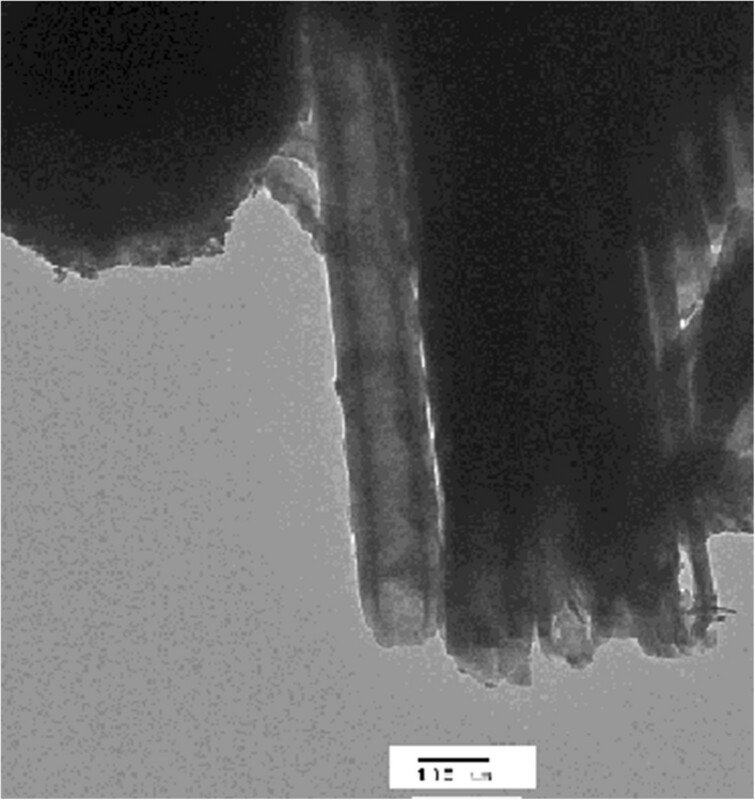 (a) TiO2 nanotubes (b) TiO2/WOx nanotubes obtained from Nyquist plots (Figure 5). The morphological and elemental analyses were carried out by scanning electron microscopy and transmission electron microscopy. No significant structural difference was observed in TiO2/WOx nanotubes compared to TiO2 nanotubes revealing honeycomb structure. Electrochemical impedance spectroscopy exhibited a high photoactivity from TiO2/WOx nanotubes compared to TiO2 nanotubes. A time-dependent impedance analysis evinced the charge retention property of the mixed oxide, indicating its possible use in many photocatalytic applications. RV carried out the morphological studies, helped MO in performing electrochemical studies, and drafted the manuscript. SI carried out the electrochemical studies. NM conceived the study and helped to draft the manuscript. All authors read and approved the final manuscript.